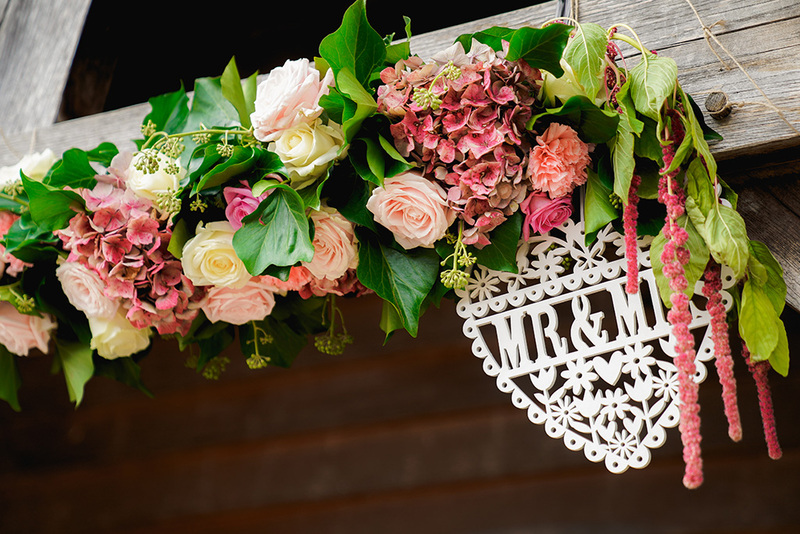 Zoë and Michael’s Sandhole wedding was effortlessly romantic and featured an abundance of beautiful blooms. 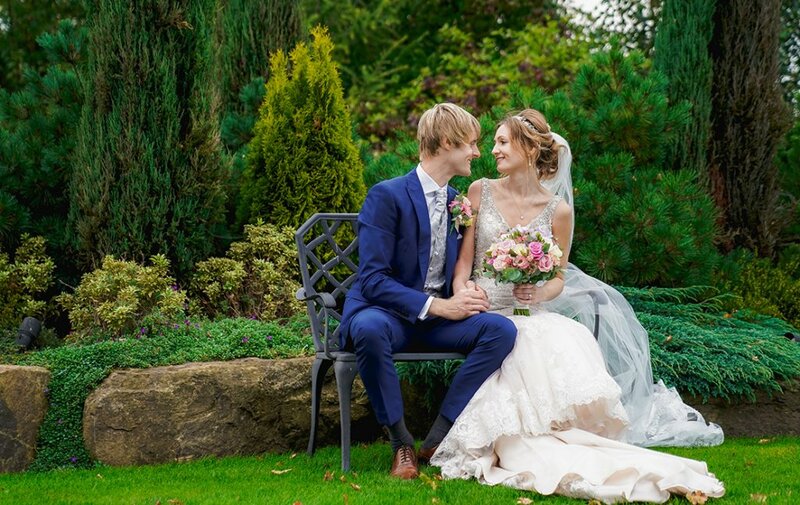 Planning their late-September wedding, Zoë and Michael were searching for the perfect wedding venue in Cheshire. 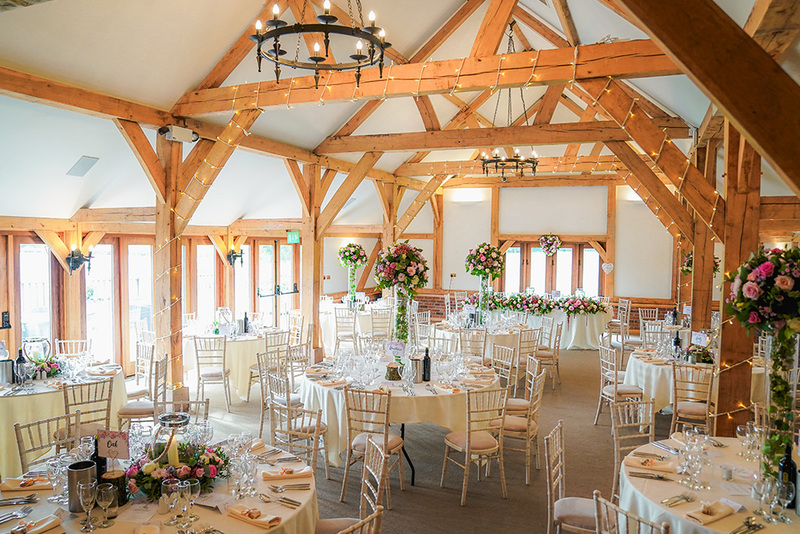 Sandhole Oak Barn fitted the bill perfectly! 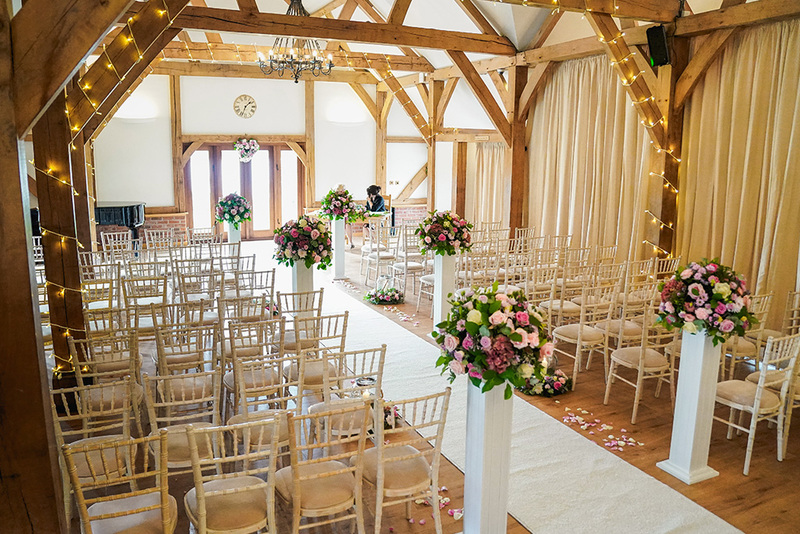 Zoë envisioned an abundance of flowers as she walked down the aisle, introducing beautiful blooms throughout the venue to bring colour to the barn. 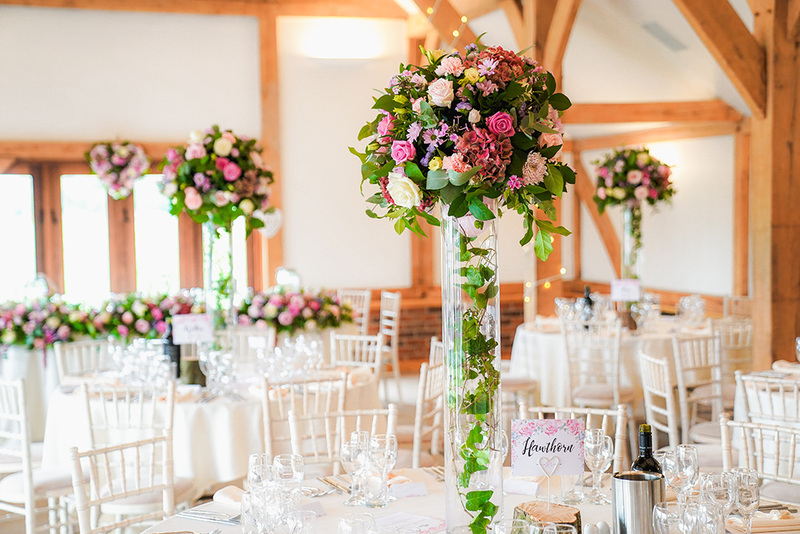 Pink, cream and purple flowers filled the barn with large arrangements lining the aisle which were then used as table centrepieces. Heart-shaped arrangements adorned the barn doors while the top table was decorated with longer designs and hurricane vases. 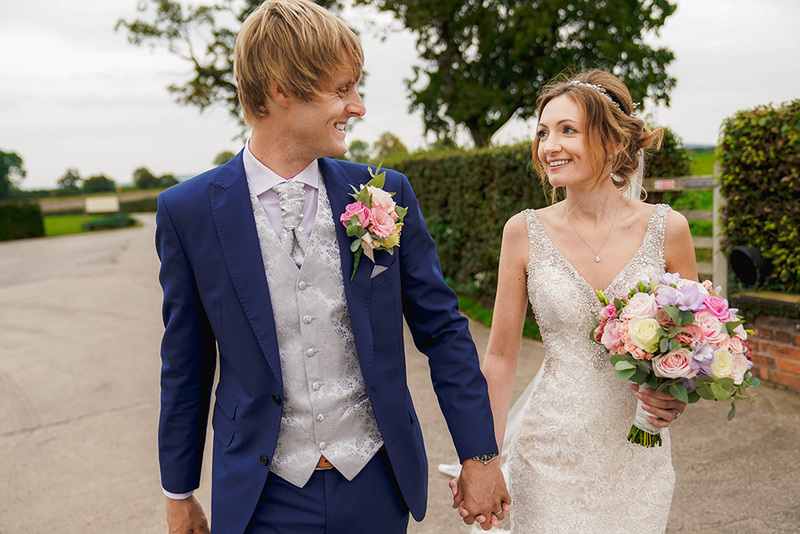 The happy couple chose a romantic theme with ivory and gold as the main colours, alongside pastel coloured flowers. The beautiful bride wore a gown by Allure from J&J Designs. 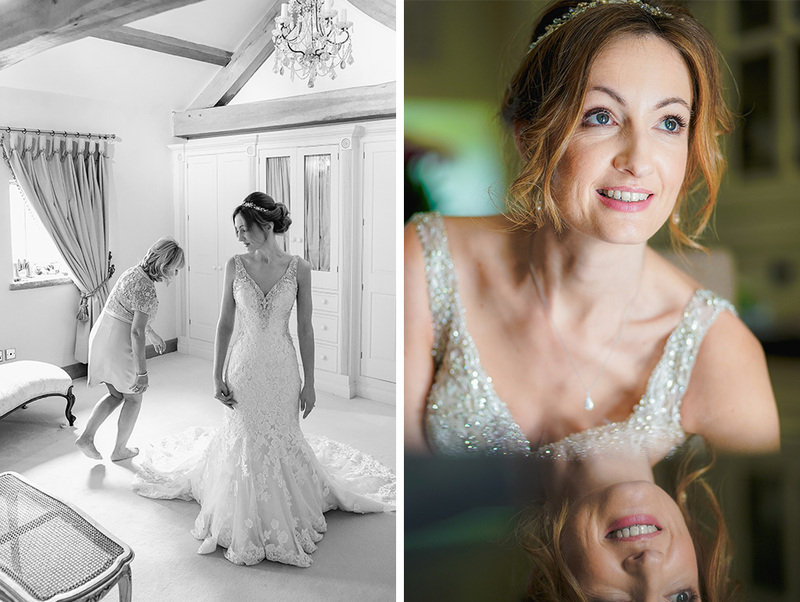 Zoë accessorised with Emmy sandals and a bespoke headpiece with Swarovski crystals and pearls. 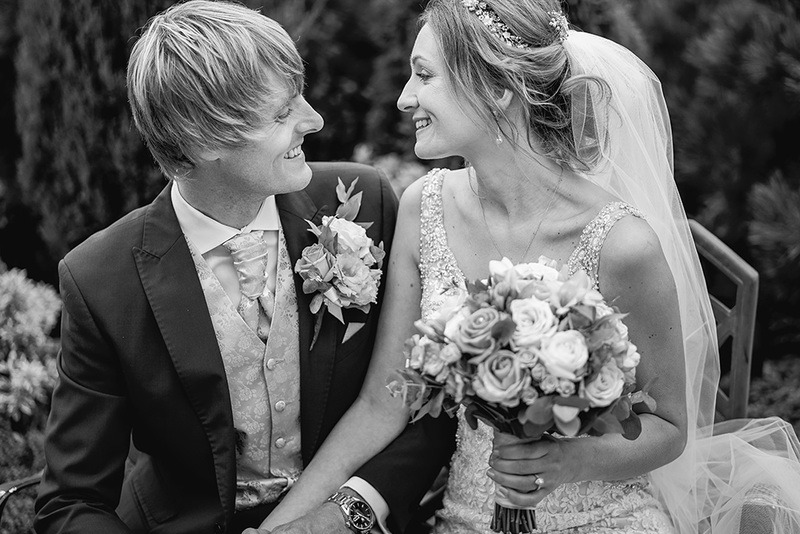 She chose delicate jewellery to match her engagement ring and also decided on a dreamy cathedral-length veil which completed the look. Michael looked the part in a blue suit from Moss Bros. 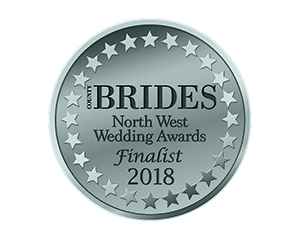 While he wore a silver waistcoat and cravat, his groomsmen wore blue waistcoats with pink ties. 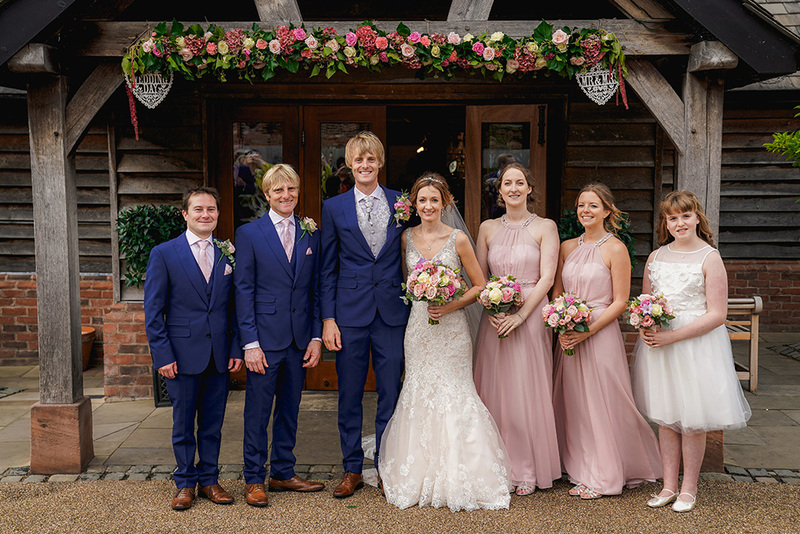 Finally, Zoë’s two adult bridesmaids were stunning in pink maxi dresses from Coast while her flower girl wore a pretty ivory dress from Marks and Spencer. 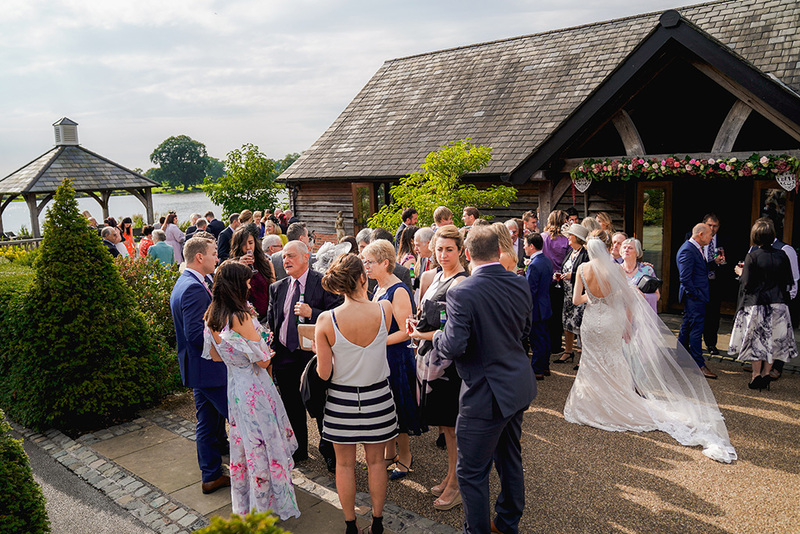 Following their civil ceremony, drinks and canapés were served alongside delicious canapés before the newlyweds and their guests moved in to dine. 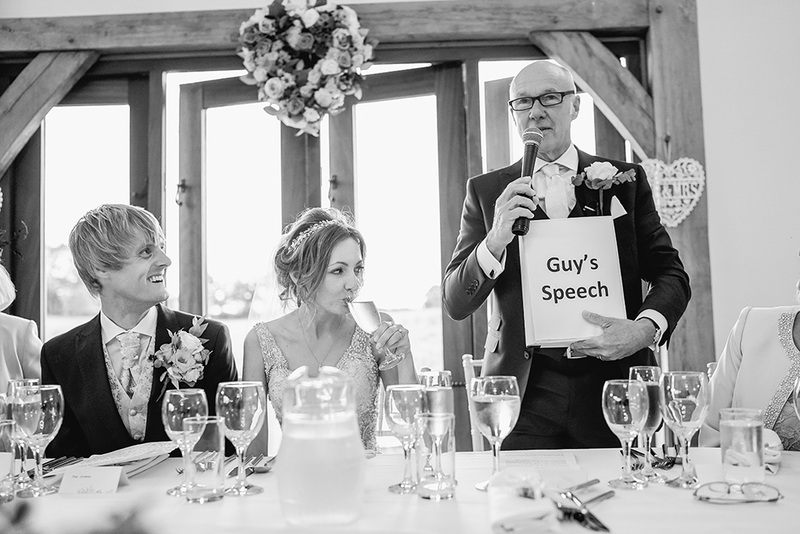 Entertainment was a big part of the day with a string quartet playing before the ceremony and during the drinks reception while singer Cole Page entertained guests during the wedding breakfast. The delicious meal started with chargrilled asparagus with a soft poached egg followed by chicken breast wrapped in parma ham. For pudding, a delicious warm chocolate brownie with vanilla ice cream was set to delight! 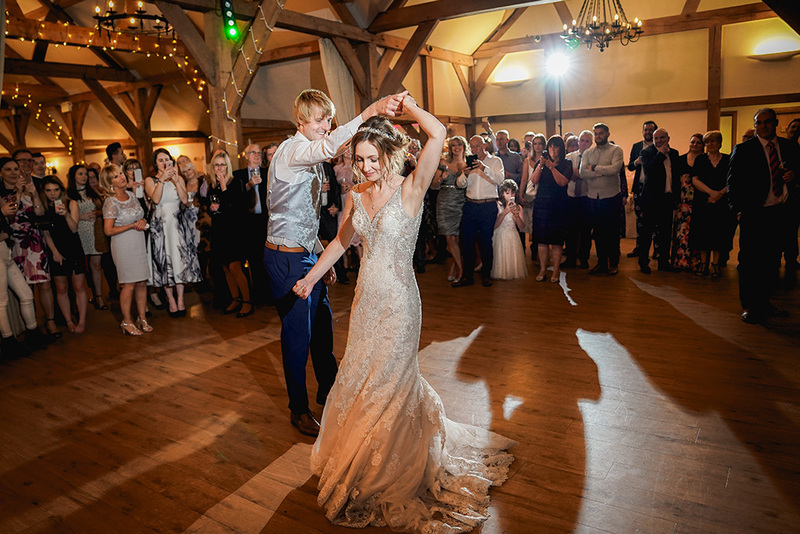 As day turned to evening, a live band, ‘Under The Covers’, filled the dancefloor and the newlyweds danced their first dance to ‘Thinking Out Loud’ by Ed Sheeran. 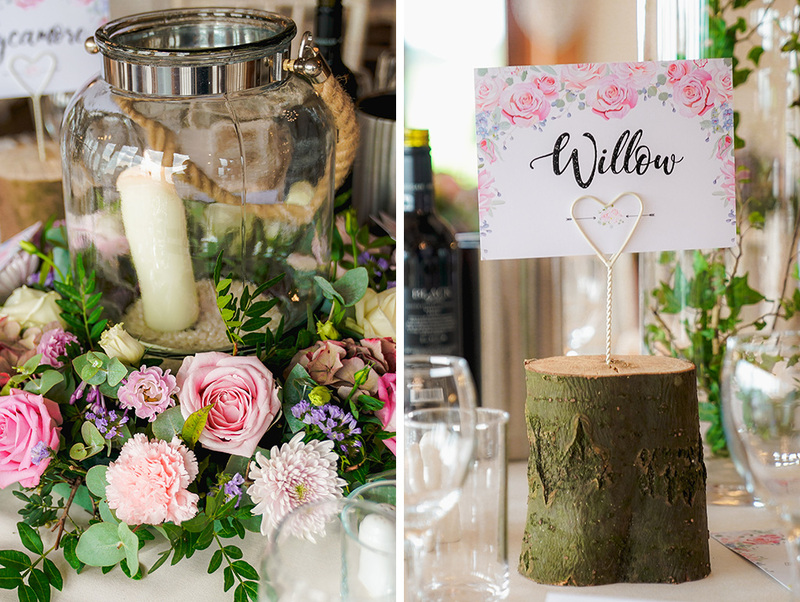 If you’re looking for further inspiration from this stunning Cheshire wedding venue, we think you’ll love Emily and Kyle’s woodland themed wedding. 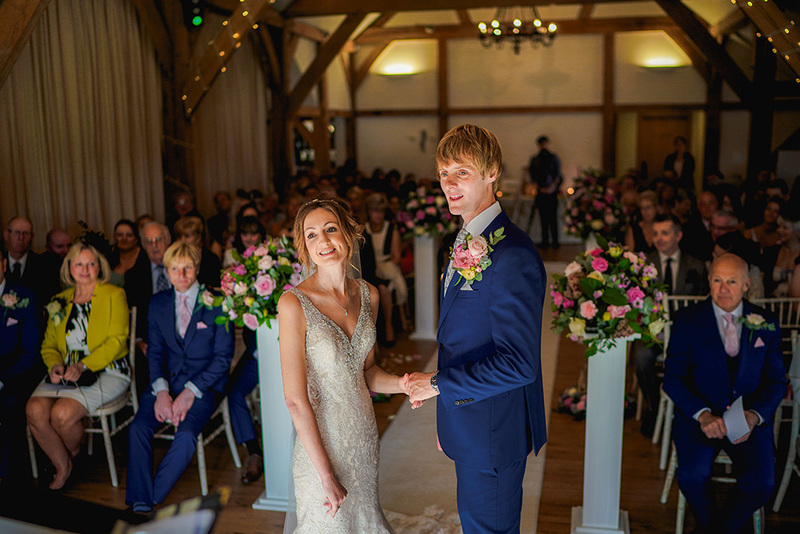 Sandhole Oak Barn Wedding Video // Zoë & Mike from Perfect Wedding Videos.